Home Designer Suite is our top‑selling home design app for DIY home enthusiasts. Created by Chief Architect, so you can enjoy the same type of tools that the professionals use for home design, interior design, and outdoor living. Home Designer Suite offers intuitive design and smart building tools for your home projects. Home Designer Suite is our most popular and best‑selling home design app. Discover why millions of do‑it‑yourselfers use Home Designer as the product of choice to create their dream homes. 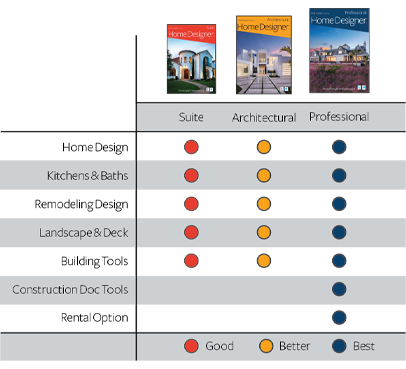 Why Choose Home Designer Suite? Home Designer Suite is our best‑selling home design software for DIY home enthusiasts. Watch the overview video and see why Home Designer Suite is a top‑selling and top‑rated app on Amazon. Roofs are simple, accurate, and update as you make changes to your design. A variety of roof styles are available with simple step‑by‑step instructions. Roofs frame accurately for every style. Ceilings generate automatically for each room. Home Designer Suite offers several options for creating cathedral, shed, or vaulted ceilings. Ceiling heights can be adjusted easily room‑by‑room. Foundations automatically generate with footings and update as the main floor plan changes. Floors and floor platforms generate automatically and include structural components and floor finishes. Floors can easily be raised or lowered. 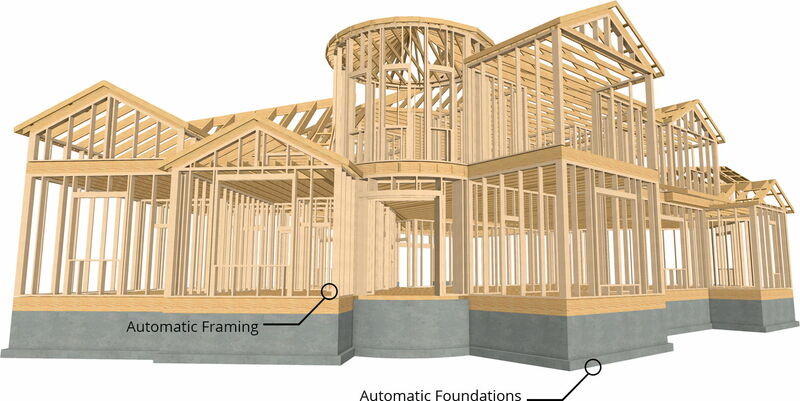 Home Designer Suite generates accurate framing automatically as you draw. Cabinets automatically conform to common kitchen and bath standards — e.g. when a cabinet is resized from 24" to 36", the door will become a double door. When you place cabinets in a corner, they automatically become corner cabinets. 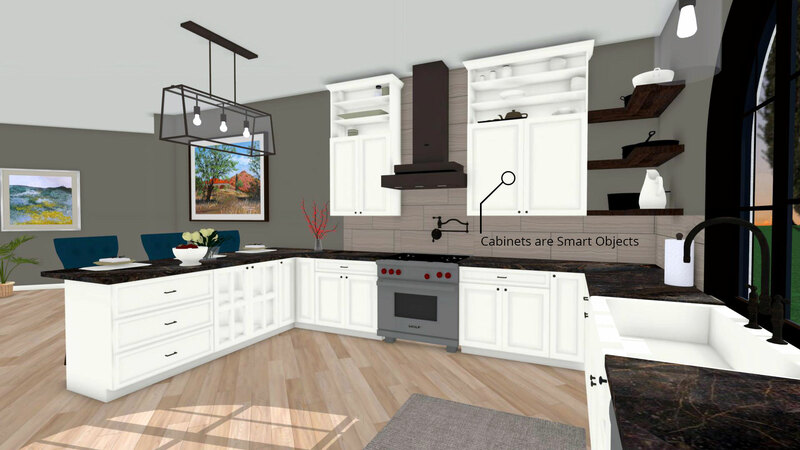 Cabinets are fully customizable with 24 door/drawer styles and can be edited in both 2D and 3D views. There is a wide variety of built‑in islands and pre‑designed kitchens that can be placed directly into your drawing from the Library. Automatically connect floor‑to‑floor. Stairs have an auto stairwell tool that produces an opening with railing. Add L‑shaped, U‑shaped, and curved stairs with a single click. Customization of stairs allows you to create a variety of styles and options. When you place a door or window in a wall the program automatically frames that opening accurately — including the header. There are a wide variety of options and shapes that can easily be customized. 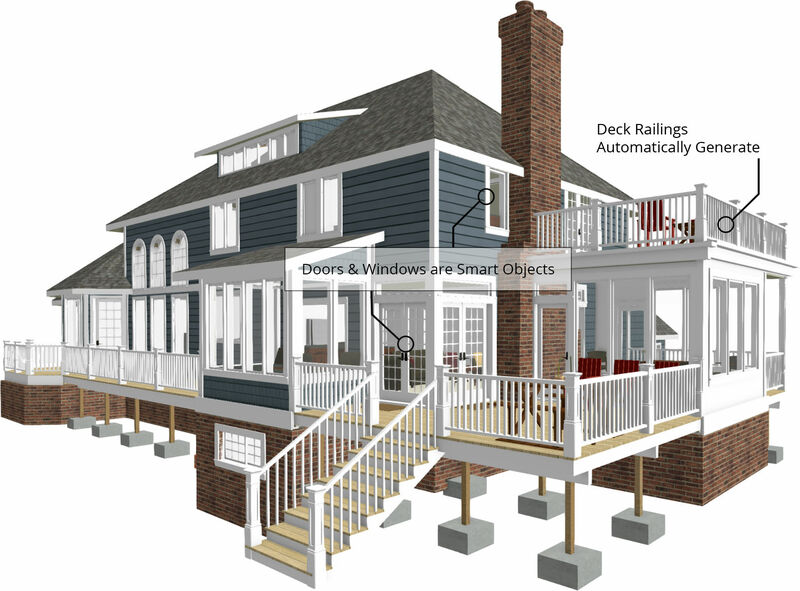 Auto‑generate the deck framing and roof over a deck. Flexible style options for planks, rails, and panels. Generate a complete materials list. 3D navigation, rendering, and editing is a clear advantage with Home Designer. You can show reflections, ambient occlusion, and bloom; all of which greatly improve the overall rendering quality. 3D navigation is natural and easy. You can edit in both 3D and 2D simultaneously using a split screen view. See examples in the Home Designer sample gallery. 360° renders can be exported to the Chief Architect Cloud (free) and then viewed or shared with virtual reality goggles such as Google Cardboard. Export 3D Viewer models to the Chief Architect Cloud (free) and then view on the web, or on your mobile device with virtual reality goggles such as Google Cardboard. View Home Designer Suite Panorama in Chief Architect’s 360° Panorama Viewer.